The standard Mexican variety for sauces and stuffing, excellent for chiles rellenos. Green-black heart-shaped fruits measure 4" long. 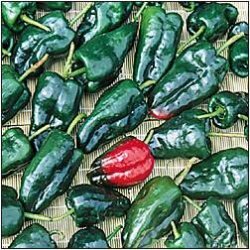 Referred to as poblanos when fresh and anchos when ripened to red and dried. Distinctive rich flavor had these stuffed with mashed potatos and mexi cheese in PV, super tasty.